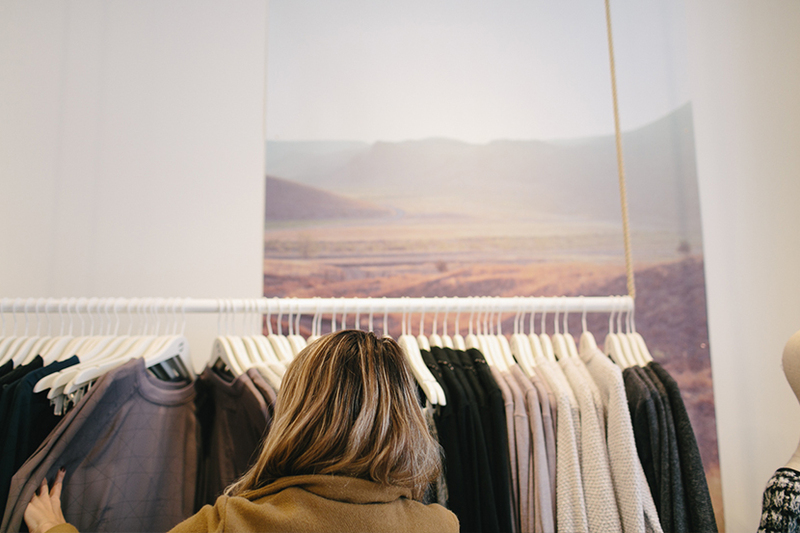 Have you ever found a store that just got you? I remember when this happened with Madewell and then AYR, and then now Lou & Grey. I remember seeing their pieces surface on Pinterest last Christmas and begging Mike to let me at least pick up one piece. 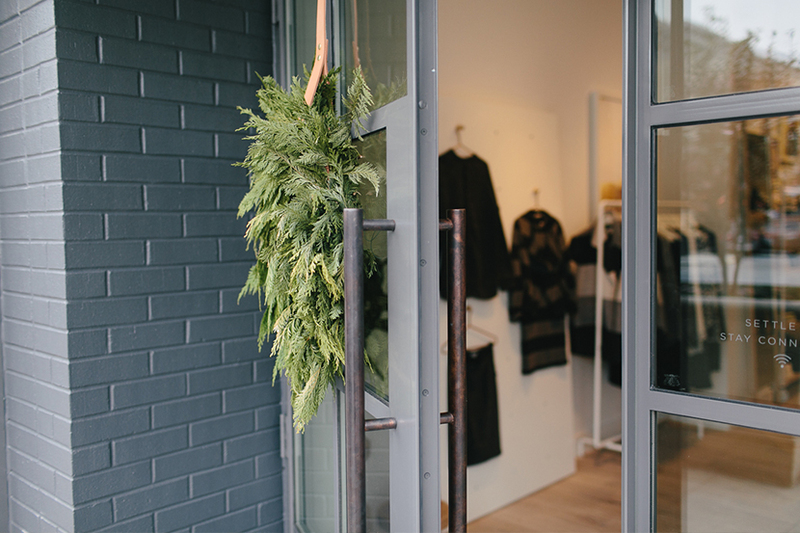 Now, with the launching of their gorgeous website, and now store fronts I have felt as if I have found my store soul-mate. Recently, Lou & Grey placed a location just about 10 minutes from our home in Raleigh at the Northhills shopping area and they asked us to come in for a visit. Located right next door to Anthropologie in the outdoor shopping center, I couldn’t wait to head in and see their in store design and experience. 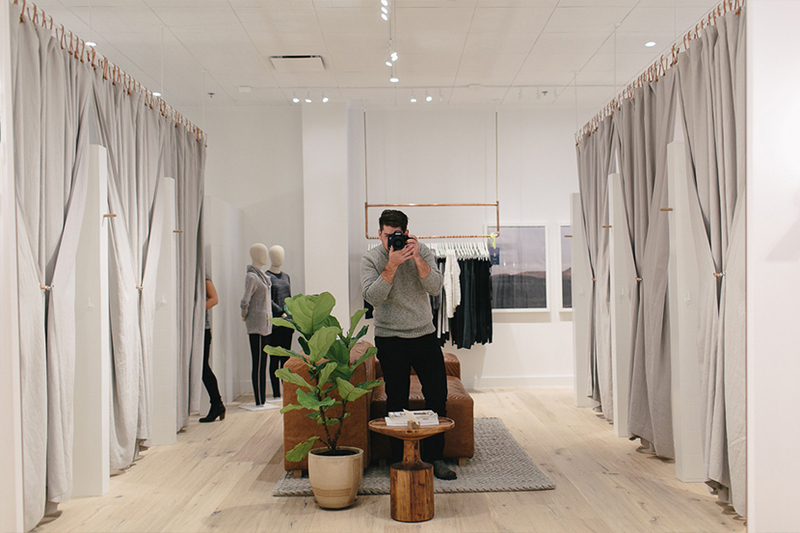 Since buying our house we have become pretty obsessed with the feeling of spaces so we were excited to see how Lou & Grey had translated their laid back style into a shopping experience that would be both relaxing and inspiring. Instantly upon walking in we fell in love with the decor, art, and how they displayed the clothes. It felt as if everything we had envisioned for our studio. 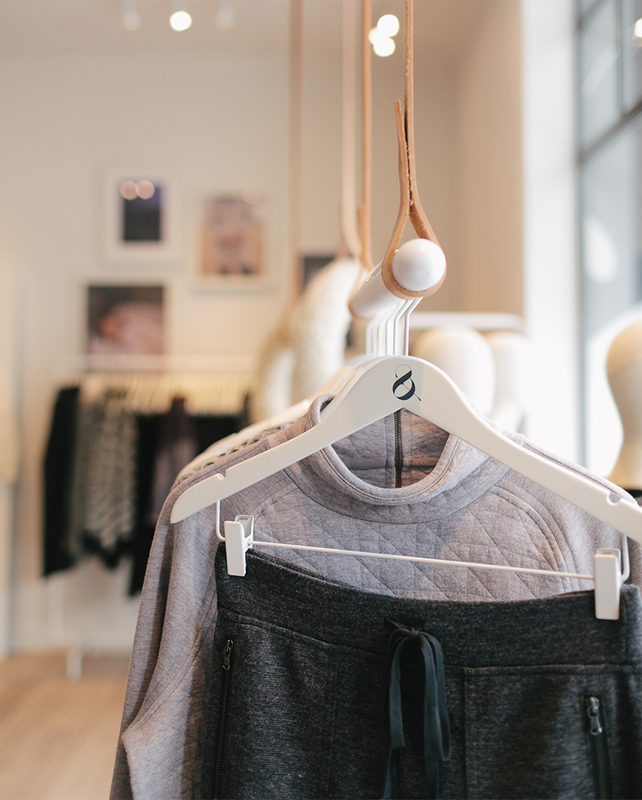 The recent collaboration with Ana Kras in Marfa was so beautifully displayed around the store, as well. Olivia, one of the associates, gave me the run down on their collaborations with artisans to create unique pieces that complimented their line. She shared about their theory on comfort, everyday pieces, and neutrals. For a long time I always felt I needed to embrace the discomfort of being stylish, but over the years I have discovered that I feel most comfortable and myself in pieces that are loose, versatile in my wardrobe, and simple. Lou & Grey felt like my perfect match. 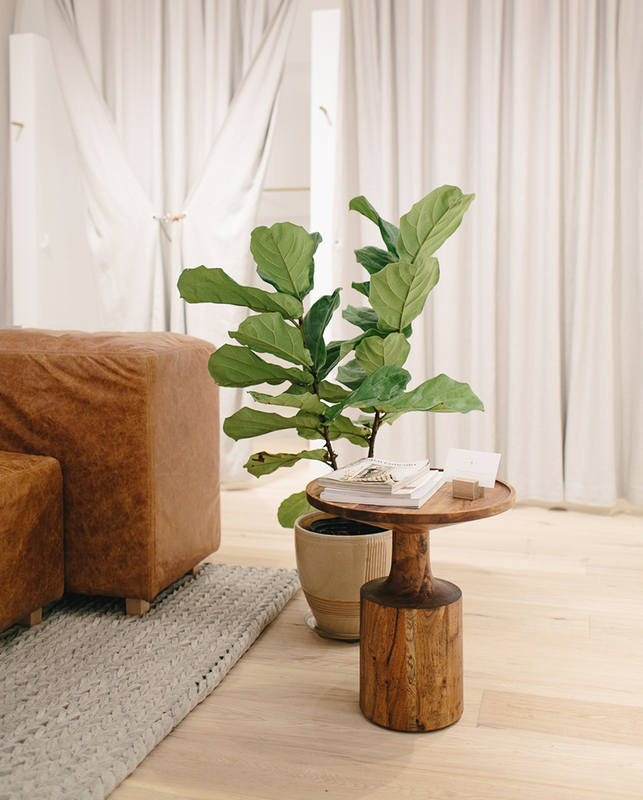 Every piece of furniture was a piece I had personally been eyeing for either the studio or our home. Then add in the custom details they brought with the leather straps and the copper hanging racks, Mike and I were pretty inspired by the space in a way we never expected. It was as if I had walked into my own pinterest boards. I chose a few pieces to add into my winter wardrobe that added the perfect texture, coziness, and details I needed. Olivia gave me some ideas on pieces that would pair well and sizes that would lay the best together. Ultimately, I came out with four pieces that will be staples in my closet this winter. 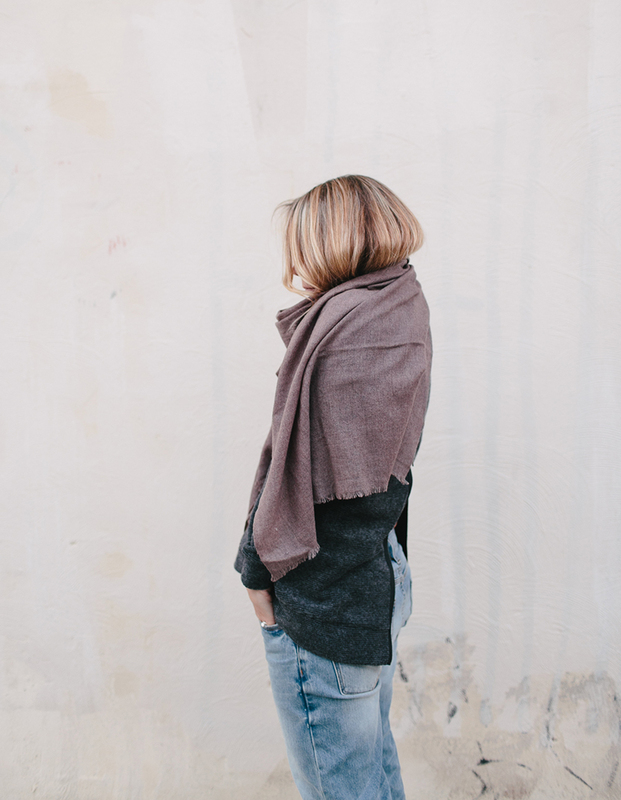 The ones I picked at the store were: the tipped popover, brushed back zip tunic, the pebbled popover, and one of their amazing scarfs which currently are only available in store (see a similar one here). All for $250 I was able to purchase staples that would be with me all season and into the spring as well. 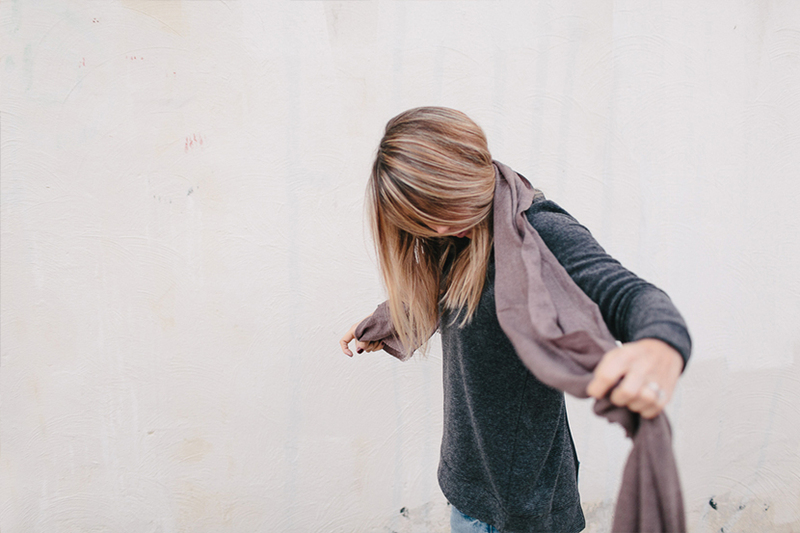 The neutral tones and the textures make them extremely versatile for a minimalist’s wardrobe. For our collaboration with them, they asked I share a way I plan to pair some of the pieces this season. Out of the four pieces I found, I chose to go with the brushed back zip tunic and scarf. During these long days I have been spending in the office hitting deadlines and closing things up for the year, have me focused on how to wear the most comfortable outfits possible without feeling as if I am giving up style. So, I pretty much wake up each day and pop on these boy jeans from Gap and whatever top sounds cozy for the day. I love this tunic because of the back zip. Too often my normal sweatshirt or sweater pairing with my jeans leaves me feeling as if there is something missing, but this back zip is the best way to up the chic game to a sweatshirt. The fabric is extremely comfortable and it can either be layered with another shirt underneath (kind of like a backwards cardigan…well at least that’s how I described it to Mike this week), or you can keep it fully zipped if you are feeling conservative and pair it with your favorite black skinnies and black leather boots for a really chic look that would be perfect for going out after work on a cold night. I picked this scarf because of the color. I had never had a piece this color before and I was so inspired by how Lou & Grey were layering this color into their outfits this season so I knew I needed it. 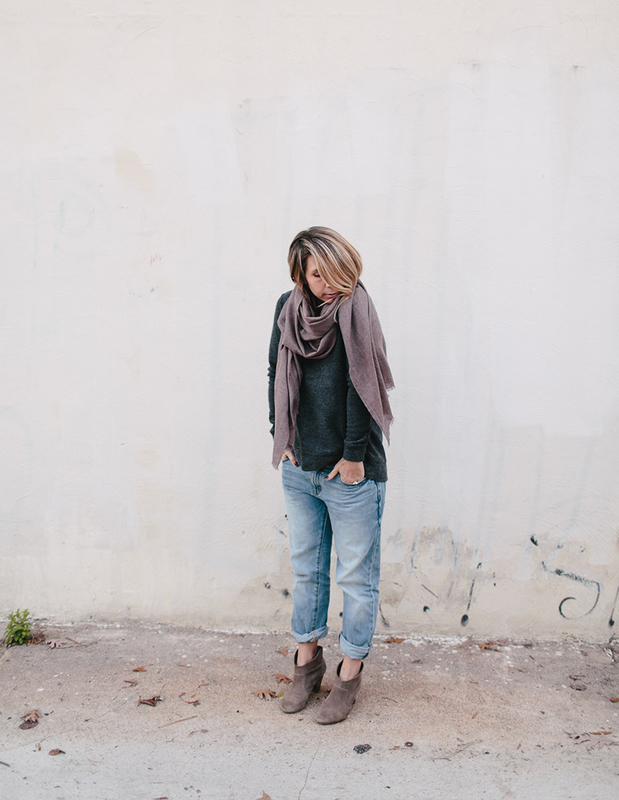 The scarf adds that tiny bit of color that feels comfortable to a neutral lover, but still adventurous enough that I felt like I wore more than just my normal black, white, gray, and denim. Honestly, I am so happy I discovered Lou & Grey and their location here in Raleigh. I cannot wait to go back and shop after the holidays. 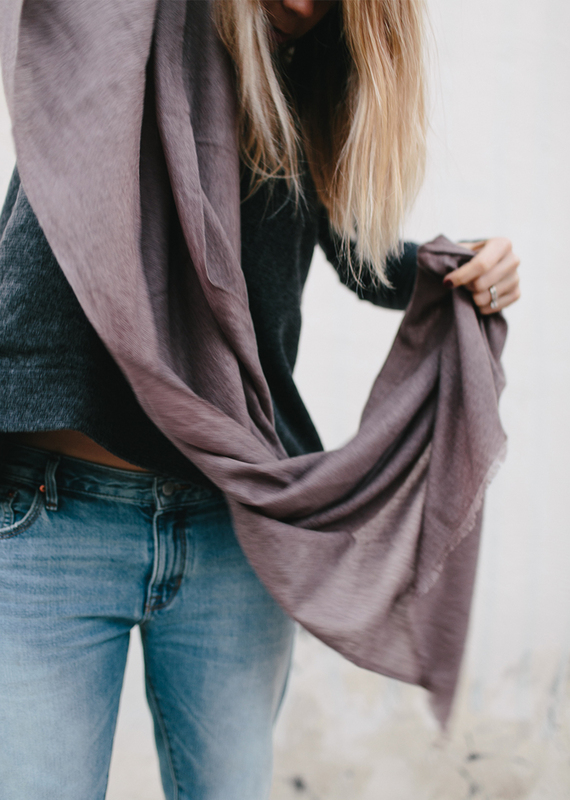 I am always looking for pieces I can wear while I work at home that feel chic but still comfy. These pieces make me feel as if there is a serious reward for waking up and getting out of my sweatpants and into an outfit like this. I can run to the grocery store or post office while still feeling inspired by what I put on that morning, even if it means I didn’t give up the comfort. 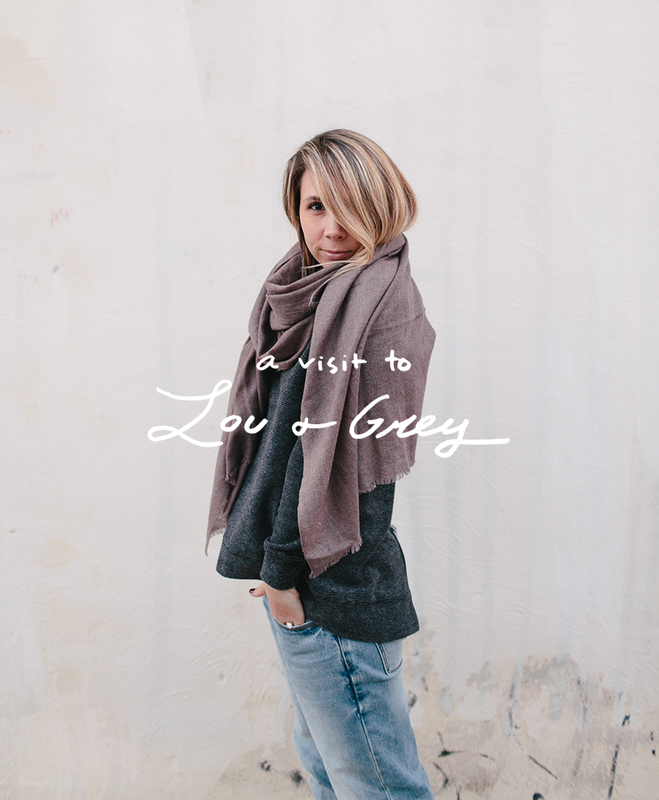 Have you ever shopped at a Lou & Grey before? If not or even if you have for that matter, you have to check out their online experience. Mike and I were very inspired by their design and user experience of the site. Check it out here. 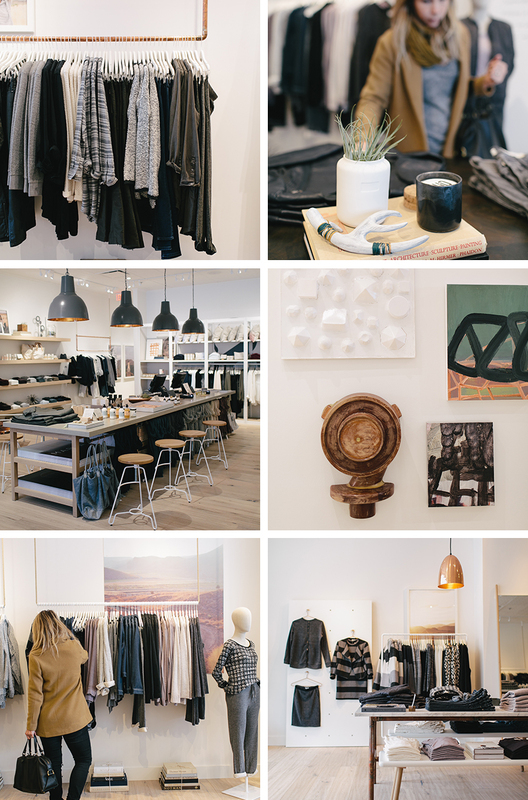 Below see my favorite Lou & Grey pieces from this story and from their store. The other pieces I wore for the story were Gap Boy Jeans and Steve Madden Booties. You can find a similar pair here. This post was sponsored by Lou & Grey, but all of opinions, thoughts, and photos are our own. Thank you Lou & Grey for partnering with The Fresh Exchange.